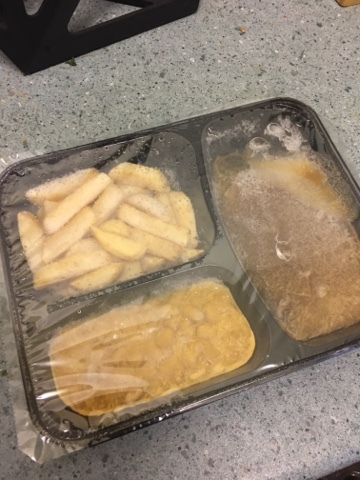 We have three frozen portions. 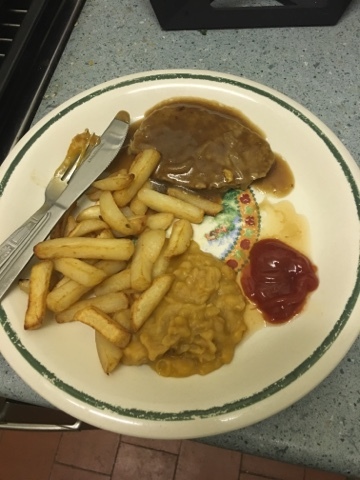 Meat, beans and chips. Like the three misunderstood food groups on our broken plate. 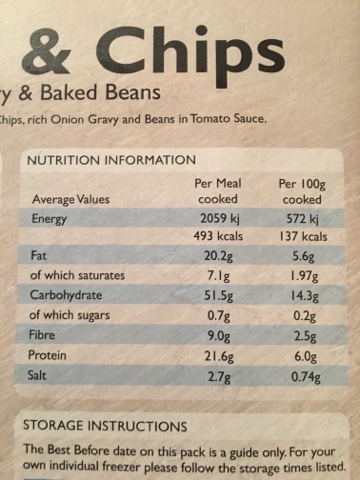 Nutritionally we get a wodge of calories, and half the days salt. Not ideal, but I was very tired and needed something where someone else had done all the work. 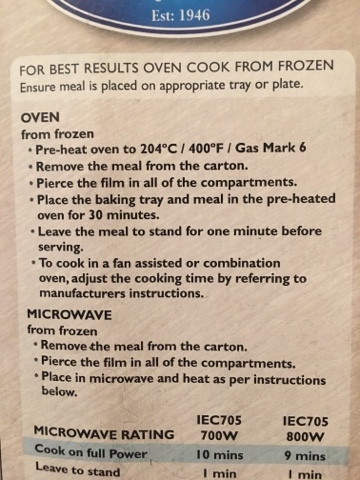 From experience i know that the microwave option is only for the desperate and leave it for 30 lonely minutes in our oven. 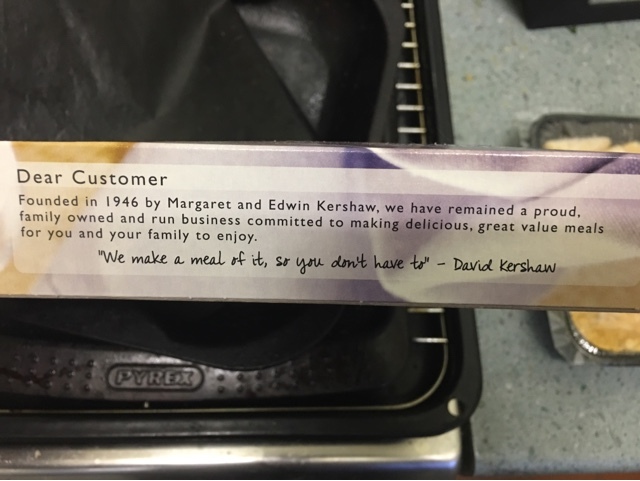 This gives me plenty of time to read the box and discover it's a family company that is in its 70th year. Maybe they know what they are doing then, and maybe they do care! 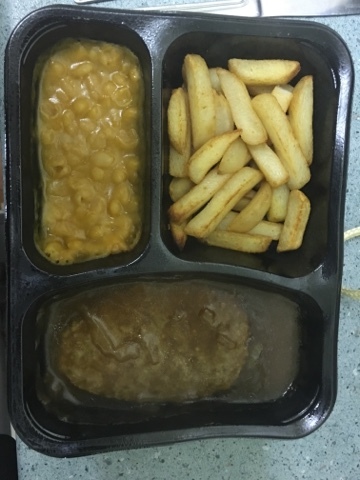 The portions are a little small - but it was only £1.59 - so I could have had two. 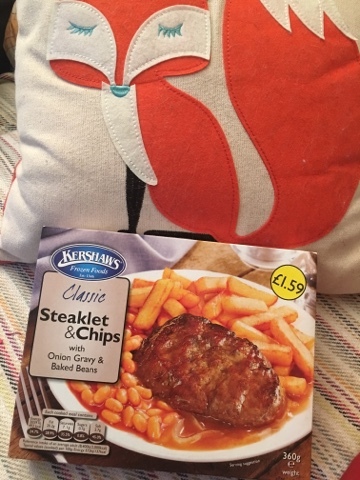 The beans are misshapen, the steak is a decent burger, and the chips are fine. It's all a bit beige so I added some red sugar sauce (or tomato ketchup) on the side. And it was perfectly fine. The flavours were muted as you'd expect, but the textures were fine and everything was cooked but not dried out like I'd feared. I'm surprising myself by saying this but is have this again. If I'd been a bit better prepared I could have added a portion of veg to bring it up to size and to help myself in the nutrition too. As far as frozen meals go this was pretty good value for money and it's no surprise that they are still in business. And in fairness to them they do have options where the beans are replaced by some frozen veg but I figured that id go full comfort food.